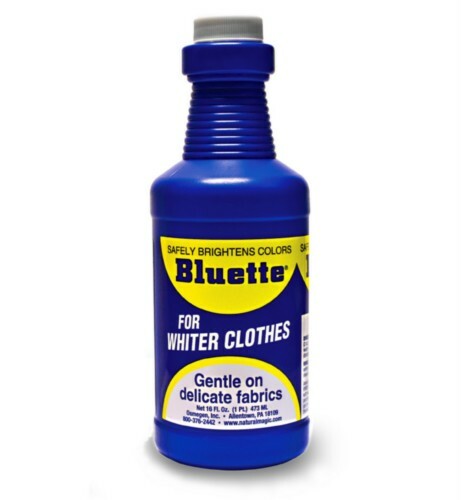 Try Bluette for whiter whites and brighter colors! Whitens white clothes and brightens colors safely. Why bluing? White fabric turns yellow or gray with age and repeated washings. Bluing restores the sparkling whiteness. Works on synthetics as well as natural fabrics without harming fibers like bleach can. Bluette Laundry Bluing can be traced back more than a hundred years. It functions as a laundry whitener because a trace of blue in the wash will enhance white and light-colored articles, making them appear whiter and brighter. Try Bluette for whiter whites! It is safe and gentle even on delicate fabrics. Laundry bluing is added at the start of the wash cycle-unlike other laundry products that are added during the final rinse cycle. Whitens white clothes and brightens colors safely! Laundry bluing is added at the start of the wash cycle-unlike other laundry products that are added during the final rinse cycle.